Photos do tell the truth, but not always the entire truth or the circumstances leading up to that photographed moment. That’s why photojournalists and editors have an obligation to contextualize photos better, writes Mount Royal University journalism student Jesse Yardley. Can a photo tell the “truth”? It’s an old debate. Some say pictures represent objective truth, while others claim they can be misleading. 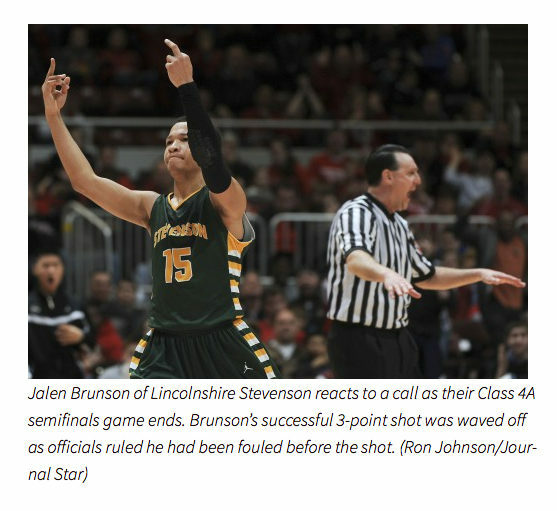 When the Journal Star, a newspaper in Peoria, Ill., recently published a photo on its website depicting a high school basketball player, Jalen Brunson, “flipping off” the opposing team’s fans, it rekindled the argument and raised important ethical questions for photojournalists and editors: Should photos be published if they only tell part of the story? What if they have the potential to cause harm? Brunson was apparently frustrated with a call made by the referee to wave off his successful three-point shot because he was fouled before he made the attempt. Had he been fouled during the attempt, the basket would have counted. Judging by Johnson’s photo and caption alone, Brunson’s actions seem unsportsmanlike. It was something the officials did not see during the game, but the photo was later reviewed by the Illinois High School Association and led to Brunson’s suspension for the next game. Scott Strazzante, a photographer working for the Chicago Tribune, also photographed the gesture as well as the moments immediately before and after. His photos provided much-needed context about what really happened. It was Strazzante’s conclusion that the gesture was unintentional and he posted a series of photos showing Brunson’s entire range of motion to back up his opinion. In my opinion, photos do tell the truth, but not the entire truth. Johnson’s photo is an excellent example of an image that needed to be contextualized. When publishing controversial images, it is the ethical responsibility of the publication’s decision-makers to consider how best to communicate the truth of the situation or event. Okotoks Western Wheel photographer Jordan Verlage said that it is the responsibility of journalists to tell the truth and to consider that photos don’t always represent what really happened. Verlage is getting at the central issue here: potential harm. It can be argued that Johnson’s photo did more harm than good. That is not to say that a harmful image should never be published, but if it is, there has to be a good reason for doing so. Photojournalists and editors must consider the news value of a photo, whether or not it serves the public good and whether it is salient to the story being told before publishing it. “If you’re running it, you’d better provide expert context,” Verlage said. Apparently, context was not available to the Journal Star because the paper’s camera system uses strobe flashes, only capable of capturing one photo per second. The Journal Star’s digital editor Adam Gerik said that was the reason the publication only had one image to work with. It was only after Strazzante’s photo series was posted online that the Journal Star’s decision to run the photo came under scrutiny. Making editorial decisions is not an easy task. Deadlines, limited resources and the necessity of making a profit complicate news production and can sometimes result in decisions that undermine the truth. Grant Black, former chief photographer at the Calgary Herald, advocates thought and analysis when making editorial decisions about controversial photos. “Pictures run with words in the mass media for a reason: they need explaining, frankly,” he said. The Star Journal updated its story, noting that the gesture was claimed to be unintentional, but has not offered an apology for running the photo. There’s no doubt that Brunson is an exceptional basketball player. Despite the foul that nullified his three-point shot, he finished the game with 56 points, setting a new Illinois semifinals record. After an appeal hearing, Brunson’s suspension was rescinded just in time for him to play his next game. Jesse Yardley is a second-year journalism student at Mount Royal University in Calgary and a professional photographer at Calgary ProPhoto. When a picture is worth a thousand words, which photo should you run?